The Echo Orbiter - "A Moment In Life That's Right"
The Echo Orbiter is a New Jersey based trio that plays 60's styled pop-psych much in the spirit of Olivia Tremor Control. 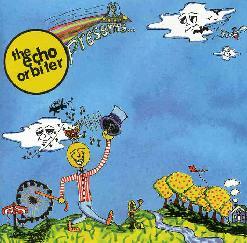 However, whereas OTC references the Beatles in much of their work, Echo Orbiter (to this listener's ears) sound a lot like a cross between early Syd-era Pink Floyd's songs and perhaps a dash of XTC. The band consists of Justin Emerle on guitars, keyboards, and vocals, Jeremiah Steffen on drums and vocals, and Colin Emerle on bass and keyboards. The twelve songs on this disc are from sessions recorded throughout 1996 and 1997. The promo material states that the idea behind the record was "creating instrument layered music in the style that engineers and producers approached in the mid to late 1960's. All the backing tracks and overdubs were pre-arranged prior to these sessions". So though I'm using early Floyd as a comparison, The Echo Orbiter had a more all-encompassing style and era in mind. This intentional process is apparent in the songs as they are clearly well crafted. But don't let the well crafted remark imply that this is overly produced because the sound is just raw enough that I may have been fooled if someone told me this was a reissued nugget from the past. Most of the songs have bouncy rhythms and lots of tempo changes. Organs and toy piano sounds abound along with a variety of guitar sounds. Wah-wah guitar is used for embellishment and there are no freakout solos here. The purpose is to assemble songs and all the cool sounds are individual parts of a greater whole. The dual vocals often harmonize and help to give the songs their raw quality. It works well. Excellent pop-psych from a band I was previously unfamiliar with. Recommended to 60's fans and the many who have discovered such music recently through bands like Olivia Tremor Control. You can visit The Echo Orbiter at their web site.